Unlimited private questions and answers: Team members can ask as many questions as they need, and unlike monolithic internal wikis, they can expect relevant answers from team members to their specific questions. Intuitive archiving feature: Tags allow users to sort through questions and answers by topic in order to dig deeper into a subject of interest. When an answer to a given question populates, the user will also see related questions and answers that could prove useful. Member profiles: The Teams platform showcases each user’s specific skill set and the topics about which they frequently answer questions, so team members know whom to consult within their organization if they need further insight. Seamless integration into the workflow: Stack Overflow for Teams is on stackoverflow.com, already a popular daily destination for developers. Furthermore, Teams integrates with existing tools like Slack, so Q&A fits easily into a team’s existing workflow and communication processes. It seems like "one more tool to try to offset the problem of requirements, code, and architectural decisions not being adequately documented for future staff to understand." I always wonder if software teams should add technical writers embed with developers, architects, QA, and BA assets to actually document EVRYTHING and keep documentation up to date. It will mean re-writing documentations as people change their minds in response to business needs but it would provide an historical record that answers "How the hell did our systems end up looking like this?" which seems to plague every organization that hires programmers to write custom code. Sometimes it's hard to give the developers who wrote the code the benefit of the doubt that they made the wisest decision based on all known variables at the time. I'm certainly guilty of questioning the intelligence, breeding, motivations, etc of the programmer of an app I had to modify once, only to realize that I had developed the code in question five years previously. Eventually I remembered why the feature had to be coded that way and wrote a 666 word comment section explaining why the feature was written the way it was and how one should orient their state of mind to understand and edit the logic. And I further apologized for the mess of code that the feature was and left my personal phone number in case a future software developer wanted to berate me for it. And four years later I got a call from someone saying they had been laughing for 15 minutes because they had gone from "WTF?" to gradual understanding as they read through my verbose description of why. Whether that dev updated the comments to reflect their changes is something to which I have no answer. Over the years working in software development I’ve concluded, reluctantly, that the ONLY documentation solutions that matter are the code, revision control logs and issue trackers. Create massive comment blocks to explain things if you have to but put it all there in the code, next to the things that matter. Then it has half a chance of still being accurate. And, you know exactly where the documentation is. If the code becomes obsolete and is removed, you naturally strip out documentation that is no longer relevant at the same time. Revision control log messages are important. I so hate lazy messages; if you change 15 files in random ways and your message is “fixed bug”, I think you should be fired. If it’s in the issue tracker, your log had better mention the number. Add a paragraph daring to explain what the hell you did so I can read a sensible log history and figure out what happened when. Issue trackers are useful for capturing every relevant detail, especially new information that is found while the bug is being investigated. The bug might come up again, and details can help to sort it out. I'm not sure if it's worth it, but this struck a chord with me: No more digging through stale wikis. Yesterday my Mac or me decided to update High Sierra from 10.13.3 to 10.13.4. 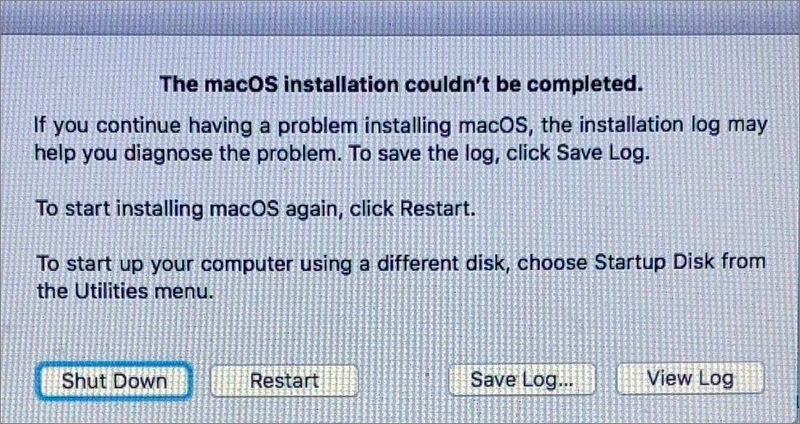 It appeared to install fine, but then it rebooted into recovery, with the Installer Log open, and a dialog that read, "The macOS Installation couldn't be completed". One thing that worked for me was holding down the Option key and selecting the original partition to boot into. It will ask you to choose wi-fi too. Then downloading the update file macOSUpdCombo10.13.4.dmg directly from Apple and installing it. Google Backup & Sync not starting or not not launching? There is the solution for this problem. As you already know, Google made an announcement that Google Drive app going away. Google Drive app for PC and Mac is officially being deprecated and the company’s developers announced in a blog post that it will no longer be supported starting December 11, 2017. Instead, you’ll need to choose from one of two new apps and I decided to go with Backup and Sync app. Backup and Sync fits my needs, but I was not able to start it after the installation. On your computer, click Download for PC. After it’s downloaded, open installbackupandsync.exe. If you see a window asking if you want to allow the program to make changes on your computer, click Yes. If you’re asked to restart your computer, do it now. Sign in with your Google Account username and password. Choose your sync settings and click Next. Run a check on the device software updates and network connection settings. Clear Backup and sync app cache. After going around and reading Google Drive Help Forum I found that there is a problem that Backup and Sync from Google application is not able to run with a standard user account without administrator privileges. One possibility is a switch-off the User Account Control (UAC) in Windows 10, but it means a decrease of Windows 10 security. Finally I have found the solution! You have to install Google Backup & Sync app on Windows 10 as administrator! After it’s downloaded, run installbackupandsync.exe as administrator. I hope it would work for you too. The most important thing to remember is that your files are still safe and you will need to replace the Drive app with Backup and Sync app before March 12, 2018, when the original apps shut down completely. I get this message almost every time I open or refresh mail.yahoo.com site. It used to be every 10 times maybe, but now its like every times I open the side. 1) Sign in to Yahoo Mail. 2) Go to your "Account security" settings. 3) Turn on Allow apps that use less secure sign in. I have been working with Sublime Text for around 3 years, and as a DevOps Engineer have no issues with it. I tried GitHub's Atom one or two year ago and I was pleasantly impressed by its active community. The reason I sticked with Sublime Text was performance - Atom was slow, even after when Atom 1.0 was released. These days, I searched "Sublime Text vs Atom", trying to see if Atom has significant improvement when I found Microsoft's Visual Studio Code. Visual Studio is also built using Web Technology like Atom, but a lot of reviewers said it is faster than anything else. So I tested and found out their performance difference today. Atom and Visual Studio Code still perform significantly worse compared to Sublime Text, for example launching and Opening windows are seconds slower which it is noticeable and they occupied much more RAM. Visual Studio Code has a big advantages over Atom in opening files and RAM usage. It could handle larger files and handle it faster than Atom. When I tested the 2.6MB file, Visual Studio Code opened the file within one second while Atom took more than two seconds. Sublime Text is still the speedy king, Visual Studio Code second and Atom is the last.